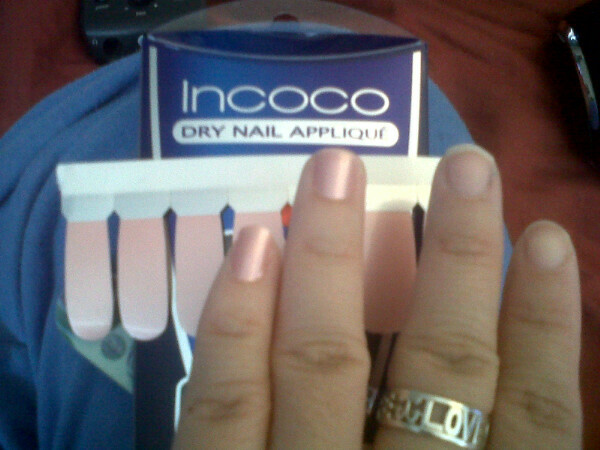 Incoco dry nail appliques give you a perfect manicure in minutes with no dry time. Details: These are dry nail appliques that are made of 100% real nail polish, they are not plastic or stickers. These act as a base coat, main color, and top coat in one. These are DBP, Toulene, and Formaldehyde free. These come in a variety of colors, glitters, and designs including a french manicure option. Where to Buy: As far as I know these are now only available to purchase at their online store for about $8. I purchased mine on clearance ($2) at Walgreens, but as far as I know they are not sold there anymore. How to use it: These come on a strip (as you can see in the picture above). You just peel the polish off of the backing and place on your nail. The package comes with a file and you use that to file off any excess. You do not need to use a base coat or a top coat with these. The first time or two that you use these it can be a bit tricky but it becomes very easy once you get the hang of it. To remove these you just use regular nail polish remover. I find that these tend to "stick" to my nails more than regular nail polish so I prefer to use acetone polish remover. Non-acetone works just fine too, but it may take a bit longer. Incoco's website has great instructions as well as videos on how to apply. Just a note: My nails are on the shorter side so I am able to use one strip for two nails which gives me more value for my money.My tip is to start with the pinky finger and work your way to the thumb. How long they last: The picture to the left is my nails on day NINE of my manicure. 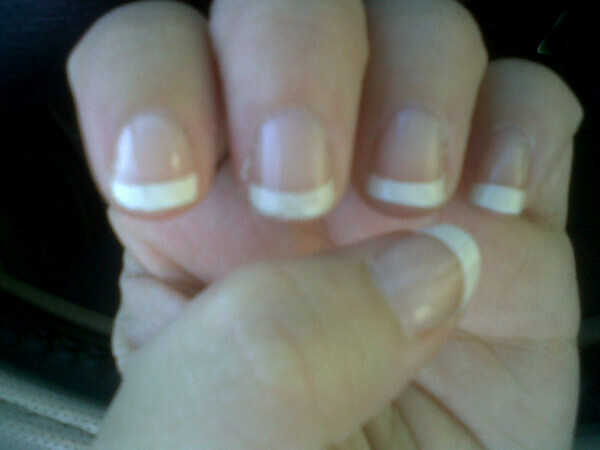 Usually I am lucky if I can get 2-3 days out of my manicure before I have to remove it because of chips. This manicure could have probably lasted a few more days as well. There was one small chip and the tiniest bit of wear at the tips. My thoughts: I love this concept as well as the product. It can be a bit more time consuming than a regular manicure to actually apply but the fact that as soon as your done, your nails are dry I would say it is worth it. I wouldn't say that these are something you would use every time you paint your nails, but these would be perfect for something like a vacation where you don't want to have to worry about chipping and touching up every few days. These a perfect for someone who wants a long-wearing manicure with no dry time and ease of application.